Birds are chirping, the sun is shining and leaves rustle gorgeously in the breeze. Nick Cave and Warren Ellis’ woeful piano score tinkles as director John Hillcoat frames the perfect face of Charlize Theron, and then cuts to the movie star profile of Viggo Mortensen, in The Road’s opening moments. All’s right with the world. Flowers are in full bloom. Everything seems clean and crisp. But going into the film, you should know that these first images are but a flashback of a bygone time in the narrative. 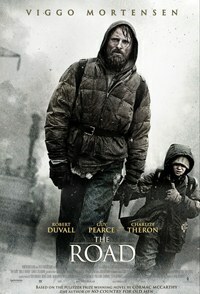 Within minutes, Hillcoat presents The Man (Mortensen) grimy, in a sleeping bag with The Boy (Kodi Smit-McPhee). They are obviously haggard, haunted. All of the color is gone. The leaves and trees have all died and given way to a stark, brutal landscape of hazy grays and browns. “It was a challenge (not working with color) said Hillcoat when we met at the loud, posh Soho Grand Hotel in Manhattan recently. “But the flashbacks were great fun because that was all about finding as much color as we could get.” Throughout the course of The Road, the pair will be searching to recapture that sun-kissed past while dealing with insurmountable odds on their path to the Promised Land. The shedding of one’s skin, becoming something new is a recurring theme in the film. There is a mournful shot of The Man letting go of his former life, of his wife’s picture, his wallet, his wedding ring, and his identity. None of these things matter anymore in this new world. The surprising way in which Mortensen plays this scene in such a non-sentimental way, and the physical commitment he brings to the part overall, clearly indicates his status as one of the most adventurous, talented actors working in film today (his contemporaries being, in my mind Edward Norton, Mathieu Amalric and Daniel Day Lewis). The horror as he reflects on his wife’s fate and forges ahead with a new self signals man’s ability to rise from primordial sadness and evil to adapt. You can only beg someone to stay with you so much if they can’t handle the harsh reality and this is what The Man must do with his wife. At key moments, Hillcoat’s film resembles the German Romantic paintings The Abbey at the Oakwood and Monk by the Sea, by Caspar David Friedrich, with cinematographer Javier Aguirresarobe (The Others, Talk to Her) evoking the funereal textures and dour colors of Friedrich’s palette (“He’s an artist” rhapsodized Hillcoat, talking about the cameraman’s work on Pedro Almodovar’s film). In both the paintings and the film, there is a turbulence in the washed-out grays, bruised purples and ashen browns and the tone of Hillcoat’s direction feels painterly, expressive, and Hillcoat cites photographs from recent disasters such as Hurricane Katrina-ravaged New Orleans and the film The Bicycle Thieves as other visual reference points. Ultimately, though, The Road is less about style than it is about the triumph of optimism, of trust. If you can have faith that if you can just make it through the day, good things can often follow, even in the worst circumstances. Life is hard. Few of us have it easy, but The Road shows that if those of us who have everything lose it all in a disaster, we can still make it out alive. We can live to fight another day. If we have to do it alone, in a pitiless world, we know it can be done. When we are left alone by those who loved us the most, that’s when our natural instinct to survive kicks in – not even death or the destruction of the world can stop that. Hillcoat is currently prepping his next feature, written once again by Cave. “It’s a gangster film, its period,” said Hillcoat guardedly, adding that the cast is set to include Shia LaBeouf, Ryan Gosling, and “a couple of others of that caliber.” The Road plays in theaters beginning November 25.